Fantasy Quest 2 is rated 3.3 out of 5 by 12. Rated 5 out of 5 by deddu from Outstanding Match 3 If you think this game is easy because of the story -- it isn't. Each level gets a little harder. You can skip the fairy story if you wish, but it is kind of fun. The fairies give you power-ups that you can use. If you get more than 4 purple flowers you get a bomb. I also liked the solitaire. In order to get three stars your times must be either 3:30/3:00. Rated 5 out of 5 by biscuitsmama from A GREAT MATCH 3 WITH A HUMOROUS STORYLINE - TERRIFIC FUN Fantasy Quest 2 is from a developer whose puzzle game Stones of Rome (also found here at BFG) is one of my favorite games. So with that being said, I was excited to try the demo of today’s game. As we begin the game we meet our Fairy guide, July, and soon we meet King Feodor who is the ruler of all the fairly lands. King Feodor has a problem because Dove Lake has become tainted with poison right before HIS big celebration. What a catastrophe. Fortunately he encounters you and Fairy July who he soon appoints to fix the problem. So off you go with July to find Fairy Leaf, who is a master, of sorts, working with potions. Well, sometimes her potions work and at others there might be rather disastrous results. The graphics are excellent and, although there are no voiceovers the dialogue is easy to read. The dialogue is very humorous and I found myself laughing out loud as I read it. Fairy July is a hoot to say the least, and I enjoyed tagging along with her as I met the various characters in the game. When we get into the actual game we have a choice of three different types of match 3 games that we can choose – something I happen to like because some gamers like one style more than another. They styles available are the traditional swap, with the other two being the chain or group type. Not all levels in the game are match 3 but some will be a solitaire game. As you play the game you will have different goals on the levels and you will have the opportunity to earn power-ups as well. If you enjoy match 3 type games, then I recommend that you try Fantasy Quest 2 because you might really like it. The dialogue alone was enough reason for me to purchase the game. So, we have a fun match 3 game with a humorous storyline that becomes more entertaining as we travel along and meet up with the different characters in the game. For me the game was so entertaining that the demo time was up before I knew it. Fantasy Quest 2 is a definite buy for me but, as always, please try the demo to see if it is a game you will enjoy. Rated 5 out of 5 by dawnajanek from Love this game This is based on the 1 hour demo. but I am going to buy this game. Not a fan of match 3 games but this one captured my attention from the start. You can choose either a hidden object game or match 3. The characters on the match 3 game are cute and very entertaining. I am looking forward to finding all the little secrets when I buy the game and play it 100 times. Rated 5 out of 5 by graceland9 from Where's the Kitchen Sink? Fairies, Crystals, Match 3, Solitaire... this game has it all. Match-3's aren't my favorite (even if I have been playing Bejeweled for years trying to make it past Level 28 in that darn Diamond Mine!) However, the storyline in FQII hooked me - cleaning the rivers to save the sick elves. As you play, you try to release fairies from bubbles, like that old Fairies match game. You're also breaking the usual chains and stopping the poison from spreading... there's a lot going on. Luckily you can make 'crystals' come down within the game and use them to release single or a group of cells so you can finish the level. And, just when I got a bit bored of Matching, whoof! Along comes a Solitaire level. Did I mention you can switch match formats within the levels? If you need to go from swap to chain or group in order to get rid of that spreading poison, you can do it with a click of a button. Excellent, and it makes this game challenging and unique. Rated 4 out of 5 by wadeckiburn from Match 3 and cool Solitaire Game : Ah Leaf, your Goth is showing Info: King Feodor needs your help! A dark shadow has been cast over the fairy kingdom, and now it's up to you to save the realm and its people. The Holy River is polluted and all animals and fairies that drink from its waters become severely ill. If you don't manage to cleanse nature, it could mean the end of your fairy friends! Are you ready to face this challenge? Luckily, you're not alone. 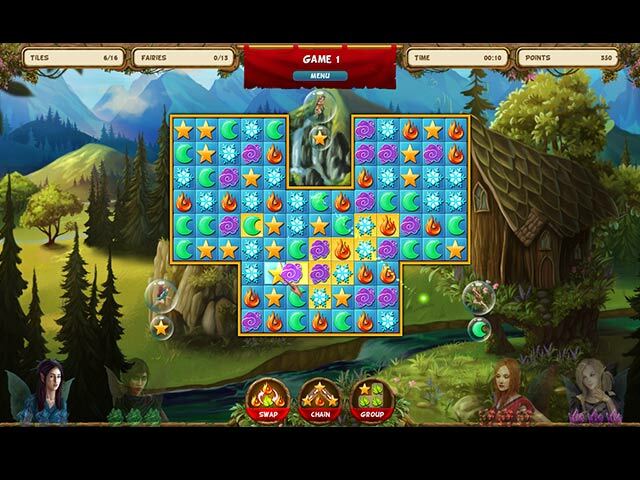 Four magical fairies will help you in this Match 3 adventure. Ok, that`s the concept, now for the game mode. As several reviewers stated, there are 3 different modes to choose from, 1) Swap (which is the only one I played) 2) Chain link or 3) Groups (which I don`t care for as I have trouble with my wrists and the constant clicking doesn`t help) Music was ok, volume very loud when you first start up, but can be adjusted in the options. Graphics were good as were the fairies, the green fairy (Leaf) looked like a goth character, but the others looked pretty. Each of the 4 fairies help you destroy the tiles with their different "powers". Match 4 purple flowers (?) in a set spot and you get a lightning bolt, which was the only thing I didn`t like as you couldn`t move it to swap with other tiles, you had to click on it to blow it up, it wouldn`t move. 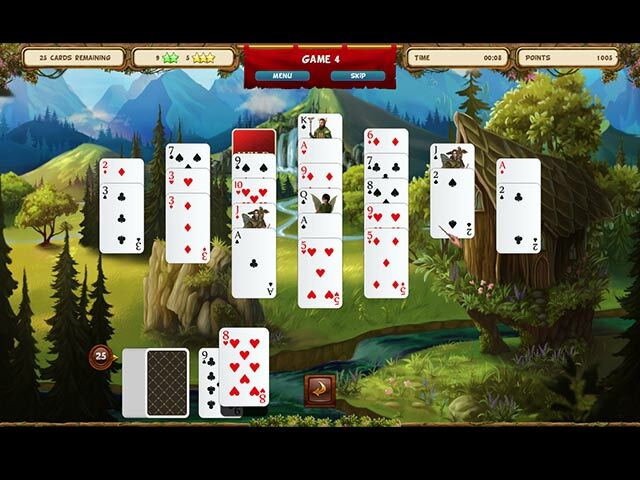 After you play a couple of rounds then you get a solitaire game with one card higher or lower than the deck card(such as a King can be played on an ace or the number 2 can be played on the ace). You will get three stars if you finish the round in a certain amount of time, and if you don`t get the 3 stars you can play any level again to obtain a better score. I played up to level 20 on the demo, and then went back and played several levels again to get a better score rating. I have a lot of match 3 and solitaire High/Low games and while this was ok, I will wait until it becomes a daily special before buying as this was really an easy game. This would be an ok game for newbies or children, but I will wait. Rated 4 out of 5 by pennmom36 from A "Fairy" Good Match 3 Game Those fairies are in trouble once again, and they need your help, one Match at a time! There are 3 different types of Match 3 games to choose from, or toggle back and forth if you want, there's the typical Swap Match 3, Chain Match 3 and even Group Match 3. Just like it's predecessor, you need to free all of the fairies trapped in bubbles by making matches of the resource shown next to each fairy. There are yellow tiles (soiled tiles) chains, poisoned tiles, oil tiles, rocks and even garbage to overcome. You will collect Fairy Crystals by dropping them off the board, a different color for each of the fairies you meet, July, Leaf, Flame, and Purple. Once you have collected enough crystals, you can summon the fairies powers which will destroy some of the tiles for you. Beware, there are Zombie fairies as well that must have their demands met quickly or they will escape and soil tiles on the board! After a few levels, you get to play a game of Higher/Lower Solitaire, which I think I actually enjoyed more than the Match 3 game. Enjoy! Rated 4 out of 5 by arnold1049 from THREE MODES OF PLAY FITS EVERYONE'S STYLE I played the complete demo. This is a slightly above average Match 3 game. The story is set in a fairy kingdom that has been having some problems. The latest is that the Holy River has been turned into tar. The king has requested help from the fairies, starting with July. July summons other fairies for help; Leaf and ultimately 2 more. The fairies represent power ups; July destroys a very small area of tiles (I was only able to destroy one each time I used her), Leaf destroys a random set of tiles and the red fairy destroys a random set of dirt and other problem tiles. I did not get to the fourth fairy during the demo. The grids start out easy; remove all the golden tiles and free all the fairies. For each board/level, there are fairies surrounding it that are stuck in a bubble. Under each bubble is the type of tile that that must be matched to release the fairy inside that bubble. Then other tasks are added; drop colored crystals off the board to charge a power up; blue crystals for July, green for Leaf, etc. ; match 4 or more purple tiles to get a bomb tile; more than one type of tile is needed to free the bubble fairies, etc. Problem tiles are the usual variety; chains, dirt, etc. To complete a level, all of the tasks must be finished within the given time frame. Each time a task is added, it takes longer to finish a level. And this is where it became a four star game instead of a five star. Although tasks increase in number and complexity, no additional time is allowed to complete the level and get 3 stars; under 3 minutes for 3 stars and under 3.30 minutes for 2 stars. I would have preferred the choice of non-timed play or at least have the allowed time increase with the complexity of the grids. One big plus for this game is the ability to play different modes of matching; the standard swap-a-tile, connecting chains of tiles (my favorite) and group (connecting tiles with 90 degree angles). For each level, play defaults to the swap mode. If you prefer another mode, you must select it for each level. This is the other reason for 4 stars. I prefer playing the chain mode but I had to select this mode for each level, again taking away from the allowed time. A better design would have been to allow the selection of mode in the options menu, then provide the buttons to switch between modes with each level. This is a definite buy for me, but I'm a firm believer in trying before you buy. Rated 2 out of 5 by robindrake29 from A literal moving target Based on the demo. Story: In this match-3 game by Rokapublish, fairies attempt to clean up a polluted river. Snarky dialogue is initially amusing, but gets old quickly. Some fairies seem rather stupid, making for insipid conversation. Gameplay: Swap, chain, and group match modes can be changed on the fly. Nice background graphics. Weirdnesses: *The game board and tokens are very small, taking up only about half the screen space. Why? *The tiny wand used for the pointer, although fitting for the story, is difficult to aim. Clicking a square next to the one intended is very easy. *The background sometimes jumps from side to side repeatedly, particularly during high/low solitaire games played between levels. These jittery movements are quite distracting. *Matching five in a row leaves one token behind, icon swollen to a larger size (though still within its miniature square), but the icon shrinks again almost instantly. I couldn't match one of these larger tokens fast enough to see whether that would provide some kind of bonus. *Bombs are distinguished only by a small lightning bolt on the icon. Several times I set off bombs accidentally while trying to make a match. Music and sound effects: Annoying, loud, repetitive background music. Match-3 levels end with a strong trumpet blare that sent me scrambling for the volume control. Overall grade: C-. The weirdnesses, particularly the small game board, made playing the game more like work than entertainment. I'm always on the hunt for a good new match-3 game. This isn't it. Rated 2 out of 5 by gg3000 from Serious yawn This Match 3 game has very little going for it. The story line is ridiculous, the game boards are small and boring, and there is nothing interesting in the game itself to make playing it worth your time. Or money. Rated 2 out of 5 by gladysschmuck from Made me nauseous, literally. I would have bought this game but the background moving back and forth with the cursor gave me motion sickness. Can't imagine why the developers thought the movement would be a good idea. : / Looks like a cute game but I don't want to have to take Dramamine to play it. I recommend this game only for those with a sterner stomach than mine.